Are Dental Implants for me? "My problem? Periodontitis. The year before last I only had three of my original top teeth. The solution? Three artificial tooth roots on each side of the upper jaw which would support a rigid twelve-tooth bridge…"
Dedicated to perfecting your smile and improving your overall oral health, our Dental Implant Surgeons can provide an aesthetic, long-term solution to the loss of one or more teeth, through the benefits of dental implants. Visit your chosen Dental Implant Surgeon in the comfort of their private practice. From the moment you arrive, you can expect to receive a warm welcome from the dental team, who with many years experience in providing specialist dental implant treatment will aim to deliver a special blend of care, advice and treatment. Restore your smile at a Implants Clinic Directory near you, discover why you can trust us and the clinics listed. If though you already have an issue or any question at all to do with dental implants then why not ask one of our full qualified dental implant experts using the ask an expert page on the site. For over 30 years now, it has been possible to replace tooth roots almost entirely with dental implants. This modern dental-medical method has been scientifically tested and used for decades. Qualified dentists and oral surgeons are offering their patients this attractive long-term solution. According to results of a survey carried out in Germany, 97 percent of patients questioned were happy with their dental implants. To find an implant surgeon just input your post code into the search box above or click to show all dental implants clinics listed. "False teeth at age 55? Impossible for me to imagine. For a long time, I’d had a bridge in my upper jaw which was slowly falling apart because more and more teeth were coming loose. The dentist suggested a plate-free removable prosthesis which would be fixed to 4 implants…"
The following list of dental professionals is not finalized and will be updated regularly by the website owners Internet Dental Marketing. It will support you to get additional information about an individual treatment with dental implants. 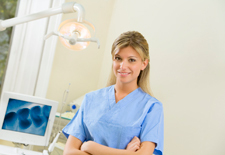 Only the dental professional of your choice is responsible for consultation and appropriate treatment.